Shell Armor The Pokémon is protected against critical hits. No moves will critically hit this Pokemon. swims by cleverly twisting its 10 tentacles about. air stored in its shell to sink and rise in water. gated the sea by adeptly twisting its 10 tentacles. eating plankton. Its fossils are sometimes found. Ruby/Sapphire OMANYTE is one of the ancient and long- since-extinct POK�MON that have been regenerated from fossils by people. If attacked by an enemy, it withdraws itself inside its hard shell. Emerald One of the ancient and long-since-extinct POK�MON that have been regenerated from fossils by humans. If attacked, it withdraws into its hard shell. FireRed A prehistoric POK�MON that lived in the primordial sea, it swims by twisting its 10 tentacles about. Leaf Green Although long extinct, in rare cases, it can be genetically regenerated from fossils. Diamond/Pearl A Pok�mon that was resurrected from a fossil using modern science. It swam in ancient seas. Platinum A Pok�mon that was resurrected from a fossil using modern science. It swam in ancient seas. Heart Gold Revived from an ancient fossil, this Pok�mon uses air stored in its shell to sink and rise in water. 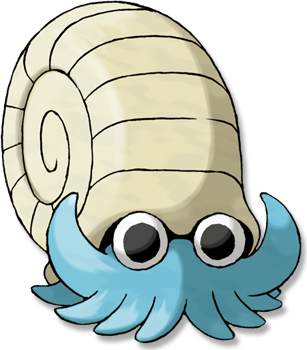 Soul Silver This Pok�mon from ancient times is said to have navigated the sea by adeptly twisting its 10 tentacles. Black A Pok�mon that was resurrected from a fossil using modern science. It swam in ancient seas. White A Pok�mon that was resurrected from a fossil using modern science. It swam in ancient seas.